Women Deserve Better: For us, that means better information, better support, and better choices. Life brings challenges. We bring empowerment, because we’ll never underestimate women. Holds his or her head up straight with little to no support. Opens his or her mouth for the spoon and closes lips over it. Keeps his or her tongue low and flat for you to put the spoon on it. Shows an interest in the food others are eating around him or her. Sits upright with some to little support. Has had significant weight gain since birth. 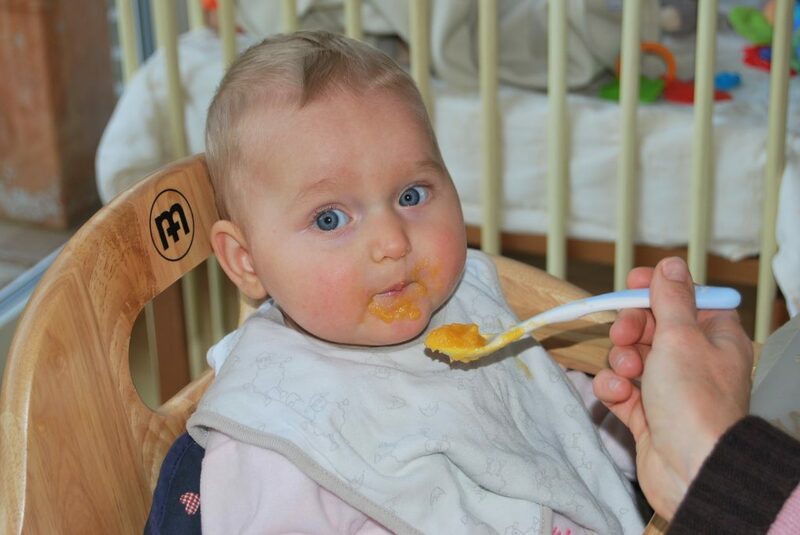 Begin feeding your baby when he or she is well rested and in a good mood. Wait two to four days between introducing each new type of food to see if there is any allergic reaction. Solid foods are not a replacement for breast-milk, which is important for nutrients and is recommended to continue feeding your baby for about a year. If you notice diarrhea, vomiting, or rashes after offering your baby a new food, stop and ask your health provider. Be encouraging as you try to feed your baby new foods as he or she can sense your feelings. Different parents prefer different techniques of introducing solid food to their children. Some prefer to put food on a spoon and hand feed the baby, while other parents prefer to put a chunk of soft food in front of the baby to let him or her figure out how to eat it. There are many suggestions on the internet and in library books on the best practices of introducing solid foods to children. 50 Baby Girl Quotes to make you laugh, cry and your heart melt! Whether you just need a quote to cheer you up and get you through pregnancy or you’re looking for the perfect sweet and funny baby girl quote to put on the nursery wall, we have gathered all of the best for you! (Paid Content) For these women, financial obstacles served as the wake-up call that pushed them to reassess, take bigger risks, and achieve even greater success. Copyright © 2019 — Feminists for Life of America • All rights reserved.